Hydraulic Component Forging - Canada Forgings Inc.
Forgings used in hydraulic components are often seen in the construction and mining industries, where they encounter many rigorous situations. These environments require equipment with structural integrity and high-quality parts. CanForge provides the forged hydraulic components that will not only survive through these conditions, but are also durable. 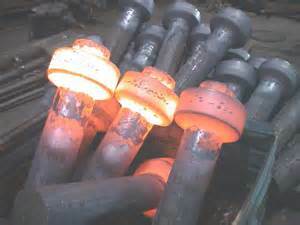 As opposed to other processes, forgings provide a wide range of benefits, most important of which is strength. An improved directional grain flow produces forgings with exceptional mechanical properties. Single-component construction also contributes to a forging’s soundness while allowing the possibility of unlimited formations, unlike multi-component fabrications. One-piece construction reduces reject costs and material waste. CanForge has the capability to meet all of your forging needs, no matter what size, weight, and quantity. From large-sized billets, an expansive list of materials, and a variety of processes to make your forgings, we are equipped to provide anything your business requires to continue operating and minimize breakdown time. Call or email CanForge today to learn more about our hydraulic component forgings or complete our Request For Quote form.